This article is about the first installment of the video game series. For other uses, see Baldur's Gate (disambiguation). Baldur's Gate is a fantasy role-playing video game developed by BioWare and published in 1998 by Interplay Entertainment. It is the first game in the Baldur's Gate series and takes place in the Forgotten Realms, a high fantasy campaign setting, using a modified version of the Advanced Dungeons & Dragons (AD&D) 2nd edition rules. It was the first game to use the Infinity Engine for its graphics, with Interplay using the engine for other Forgotten Realms-licensed games, including the Icewind Dale series, as well as other licensed D&D campaign worlds such as Planescape: Torment. The game's story focuses on players controlling a protagonist of their own creation who finds themselves travelling across the Sword Coast alongside a party of companions, to unravel the mystery surrounding a sudden iron crisis affecting the region and attempting to discover the culprits behind it, while uncovering dark secrets about their origins and dealing with attempts on their life. The game received critical acclaim following its release and was credited for revitalising computer role-playing games. Its success led to an expansion pack entitled Tales of the Sword Coast, as well as spawning a sequel entitled Baldur's Gate II: Shadows of Amn, which later received its own expansion called Throne of Bhaal. An enhanced version of the Infinity Engine was later created as part of Beamdog's remake, entitled Baldur's Gate: Enhanced Edition, the first new release in the franchise in nearly nine years. 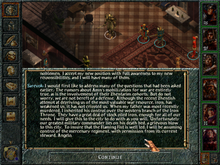 A screenshot of Baldur's Gate, showcasing the user interface designed by BioWare in order to provide relative ease in playing the game, with the UI template used in other Forgotten Realms-licensed games, such as Icewind Dale. The game also relies heavily on plot and dialogue as driving factors behind how it conveys the main story. Players conduct the game from a top-down isometric third-person perspective, creating a character for each playthrough who then travels across pre-rendered locations, taking on quests, recruiting companions to aid them, and combating enemies, while working towards completing the game's main story. Control is done through a user interface that allows a player to move characters and give them actions to undertake, review information on on-going quests and the statistics of characters in their party, manage their inventories, organize the formation of the party, though the screen does not need to be centered on the characters being controlled and can be moved around with the mouse and keyboard, the latter also capable of accessing various player options through keyboard shortcuts. All of the gameplay mechanics were coded to conform to the Advanced Dungeons & Dragons 2nd edition role-playing rules, with game automatically computing the rule intricacies, including tracking statistics and dice rolling. Although the game is conducted in real-time, some elements of the ruleset used in the coding were modified to allow it to feature a pausable real-time mode, allowing players to pause the game at any time and prepare what actions a character do, including the ability to set the game to automatically pause at preset points in combat. A new playthrough requires the player to either create a new player character (PC), or import one they exported from a previous playthrough. Every new character requires the player to determine what their name, gender, race, class, and alignment are, and what ability scores and weapon proficiencies they have, with thieves requiring points be allocated between their thieving skills, and spellcasters having a few spells set up for them - those using priest spells have them available for use from the start, while those using wizard spells add them to their spellbook and have one primed for use at the start of a new game. New PCs can be multi-class, but must adhere to the restrictions that come from this, in accordance to the 2nd edition rules; a character who is both a cleric and a fighter, may only use weapons of the former class. The game's main story is divided up into eight parts - a prologue and seven chapters - with each requiring the player to complete a specific task in order to complete it; while free exploration of the game's world map is allowed from the outset upon completing the prologue, some areas are not accessible until the player has advanced to a specific chapter. With the exception of imported characters, all PCs begin off as weak characters from the start, but eventually grow stronger as the player explores the game's world, completing both the major quests and the game's large variety of side quests, killing hostile enemies, earning experience points to level up their character, finding new spells to use and new pieces of equipment to wear, and recruiting a variety of companions, each with different classes and skills, to aid them in their travels. A PC may have up to five companions travelling with them in their party, with the player free to decide who to recruit and who to dismiss from the party. Upon reaching the experience threshold for their current level, defined by their class, both the PC and companions can level up, increasing their hits and occasionally improving their weapon proficiencies, with thieves provided additional points to distribute between their skills, and spellcasters gaining access to additional spell slots, sometimes gaining access to new ones for higher levels of magic. All characters are limited to a maximum number of 89,000 experience points in the game, with characters who multi-class being also affected by this cap - an elf who uses two classes may only earn half the cap in each, with experience divided equally between the two classes, while a human who dual-classed after earning a third of the cap in their base class, may only earn the other two thirds in their second class. The main user interface consists of three action bars surrounding the main screen. The first bar consisting of buttons to the various options players can use, including a map of the party's location and the world, the journal that logs all details of notable events and all on-going and completed quests, character records for each member of the party, the inventories for each character, spellbooks containing all spells available for spellcasters, a time display that also acts as the pause mechanism when clicked, and the various game options. The second bar consists of the portraits of each character currently in the party, detailing their hit points, their order, and any positive and negative effects they are experiencing, with the portrait switching from colour to greyscale when the character has died. The third bar provides specific actions depending on the number of characters being controlled by the player; if one is selected, the player has the ability to switch between the weapons they are using, use any spells and items set up for quick use, and utilises a character's special abilities or those of certain pieces of equipment, but if more than one is selected, the bar displays options for conversing with or attacking NPCs, regardless of being friendly, neutral or hostile, stop what is being done, and change their formation to those available in the game. The inventory system used in Baldur's Gate follows the conventions of the "paper doll" mechanics, in that each character can equip items depending on what type they are - weapons, ammo, armour, helmet, necklace, rings, belt, cloak, feet, and usable. The number of items a character can both equip and carry is affected by their weight limit, which is determined by their Strength ability score; going over this limit will encumber the character causing them to move slowly or prevent them moving altogether, until they remove items from their inventory. The system notably indicates what equipment a character can not use as defined by their class, which also determine how many weapon slots they have available for weapons; by default, all character have two weapon slots along with an off-hand slot for shields and weapons, but some classes allow character to one or two extra weapon slots to use. In addition, characters may equip three stacks of ammo for ranged weapons (bows, crossbows and slings), and use three different types of usable items (potions, scrolls and wands). Items can be examined in the inventory, though most enchanted items require identification before their properties are known, while any cursed equipment can't be removed unless through magic or visiting a temple. Any potions found can be used without being set up for quick use, while mages can learn spells from scrolls that they do not have knowledge of and have room for in their spellbook; unlike priest classes, who have access to all the spells of each level magic upon acquiring a slot in that level, mages need to learn spells from scrolls found in their travels or bought from shops, but can learn those of higher levels that they do not have spell slots for, though higher game difficulties incur the possibility of failing to learn a new spell. In addition, any spells set to a spell slot cannot be used until the spellcaster rests first to "memorise" it. Dialogue is an important aspect of the game, which relies heavily on it. Conversation can be initiated by players selecting a member of the party and clicking on a friendly or neutral NPC, though some conversation are initiated automatically when characters come close to them, and while most conversations are mainly text-based, some include spoken dialogue. Most conversation include a list of responses that a character can use, some that can provide information on certain topics, lead to quests, or access services, while others can influence a situation, such as provoking a fight, or finding another way to solve a problem. Certain NPCs offer services that character can use when talking with them, including shops where characters can buy and sell items and get unknown enchanted items identified, inns where the party can rest in safety and recover lost hit points and memorise spells, and temples where characters can pay for healing services, such as resurrecting a dead party member. The ability to customise their PC after creation, albeit with some restrictions. The ability to change the primary and minor colours used by each character. The ability to switch on/off the game's AI, and change what AI script a character uses ; one script might dictate they proceed to engage an enemy when spotted, while another might dictate they keep their eye out for traps. Most locations are hidden when first visited but are revealed as the character moves around them. A fog of war effect hides explored areas when the player's characters move away from them. A reputation system that tracks the moral actions of the PC and affects how they are perceived, changing if they resolve a problem or commit a crime in the view of witnesses. Higher reputations cause shops to decrease prices, while lower reputations cause shops to increase prices. Lower reputations may also lead to the character being attacked when in town. Companions are also affected by reputation, with evil companions leaving the party, even attacking it, if it is high, and good and neutral companions leaving when it is low. Some side quests also require a minimum reputation to begin. Certain NPCs may also react negatively or positively depending on their alignment and the player's reputation. The ability to keep track of in-game time through the changes in lighting and the activity that is occurring. Characters become fatigued after spending a full in-game day, especially after travelling long distances between world map locations, and must rest to recover, either in an inn or camping out in the countryside/within a dungeon. Characters can be ambushed when camping out or travel long distances between world map locations. Players can play either in single-player mode, or in multiplayer mode. The latter allows up to six players to work together online with their own created characters. Baldur's Gate takes place in the fictional world of Ed Greenwood's Forgotten Realms setting, during the year of 1368DR in the midst of an apparent iron shortage, where items made with iron inexplicably rot and break. Focusing upon the western shoreline of Faerûn, the game is set within a stretch of the region known as the Sword Coast, which contains a multitude of ecologies and terrains, including mountains, forests, plains, cities, and ruins, with the story encompassing both the city of Baldur's Gate, the largest and most affluent city in the region, and the lands south of it, including the Cloud Peaks, the Wood of Sharp Teeth, the Cloakwood forest, the town of Beregost and the village of Nashkel, and the fortress citadel of Candlekeep. In addition to the region, a variety of organisations from the Forgotten Realms setting also feature as part of the game's main story, including the Zhentarim, the Red Wizards of Thay, The Iron Throne, the Flaming Fist, The Chill, The Black Talons, and the Harpers. Baldur's Gate includes around 25 player companions that can join with the PC. A number of the characters who appear include several who are canon to the official Forgotten Realms campaign setting, including Drizzt Do'Urden and Elminster. The player plays as the young and orphaned ward of the mage Gorion. The two live in the ancient library fortress of Candlekeep. Abruptly, the Ward finds themselves ordered by Gorion to prepare to leave the citadel together during the night with no explanation. On the night of leaving Candlekeep, a mysterious armoured figure and his cohort ambushes the pair and orders Gorion to hand over the Ward. Gorion refuses, and dies in the ensuing battle, while ensuring that his Ward can escape. In the morning, the Ward encounters Imoen, a childhood friend and an orphan like them who lived in Candlekeep, who had followed them in secret. With no safe hiding place available, Candlekeep no longer accessible to them without Gorion's influence to circumvent its admission fee, and the city of Baldur's Gate currently closed off to outsiders due to bandit raids, the Ward resolves to investigate the cause of the region's Iron Crisis. Travelling to the mines of Nashkel, the main source of the region's iron, the Ward's party discovers that the mine's ore is being contaminated by a group of kobolds led by a half-orc, and that they and the bandits plaguing the region are being controlled by an organization known as the Iron Throne, a merchant outfit operating out of Baldur's Gate. After sabotaging a mine operated by the Iron Throne in the Cloakwood that would presumably give them total control over the region's iron, the Ward's party head into the newly reopened Baldur's Gate. Venturing to the Throne's headquarters, the group learns that proof of the organization's involvement with the Iron Crisis was taken by one of the regional leaders when they and the rest of the leadership headed to Candlekeep for an important meeting. Revealing their findings to Duke Eltan, the leader of the Flaming Fist, the group receive a rare and valuable book, which would allow them access into Candlekeep, in order to spy on the meeting. During their investigations in the citadel's library, the Ward discovers a prophecy written by the ancient seer Alaundo, foretelling how the offspring created during the Times of Trouble by the dead god Bhaal, the Lord of Murder, will sow chaos until only one remains to become the new Lord of Murder. The Ward then finds a letter from Gorion revealing that the Ward is among the offspring of Bhaal, known as Bhaalspawn. During their stay at Candlekeep, the Ward's party is imprisoned for the murders of the Iron Throne leaders, regardless of whether they did so or not, until they can be transported to Baldur's Gate to be executed. Tethoril, a prominent keeper in Candlekeep, visits the party and reveals that a suspicious character the party met earlier, Koveras, is really the foster son of one of the now dead Iron Throne leaders. His name is Sarevok, the one responsible for Gorion's murder, and also wishes to kill the Ward. Believing the Ward to be innocent, Tethoril transports the party into the catacombs beneath the fortress, where the party battles their way through doppelgängers taking on the form of people the Ward knew in Candlekeep. Returning to Baldur's Gate, the Ward's party find themselves accused of causing the Iron Crisis on the orders of the Kingdom of Amn, assassinating one of the city's Grand Dukes, and poisoning Duke Eltan. Forced to stay hidden from the Flaming Fist, the party discovers that the Iron Throne orchestrated the Iron Crisis to gain control of iron through their mine in the Cloakwood, while using doppelgängers to weaken other merchant outfits, ensuring that they would have a monopoly on iron. With tensions rising between Baldur's Gate and Amn, the organization hoped to sell the stockpiled iron to the city at exorbitant prices. Afterward, they aimed to de-escalate tensions between Baldur's Gate and Amn. The party also discovers that Sarevok, having uncovered that he was a Bhaalspawn, hoped to fuel distrust between Baldur's Gate and Amn by making each think the other was responsible for creating the crisis, and cause them to go to war. Sarevok believed that the resulting carnage would be enough to allow him to become the new Lord of Murder. Due to the Ward's similar background, he hired assassins to kill them. Sarevok remained loyal to his father until the Iron Throne's meeting in Candlekeep threatened his plans, which led Sarevok to eliminate him and the other regional leaders of the Iron Throne before taking over the outfit and transferring their stores of iron to the city in order to be seen as a savior. He was also responsible for the poisoning of Duke Eltan and the assassination of one of the four Grand Dukes. The Ward's party gain entry to the Duchal Palace, where the coronation of Sarevok as a Grand Duke of Baldur's Gate would be held, and present evidence of his schemes. Exposed, Sarevok flees into an ancient underground ruin beneath Baldur's Gate, with the Ward and the party following after. The Ward confronts Sarevok within an ancient temple to Bhaal, and defeats him, saving the Sword Coast and ending their brother's schemes. In the final ending cinematic, Sarevok's tainted soul departs his body and travels deep underground to a large circular chamber of alcoves, and destroys a statue of himself contained in one of the alcoves, whereupon it is revealed that the other alcoves each contain a statue of a Bhaalspawn that exists in Faerûn. Baldur's Gate began development in 1995. Baldur's Gate was developed by Canadian game developer BioWare, a company founded by practicing physicians Ray Muzyka and Greg Zeschuk. The game was initially titled Forgotten Realms. According to Muzyka, "Our head programmer has actually read every one of the [Forgotten Realms] books - everything, every single one of the short stories and the paperbacks. He made a point of it. He really want to immerse himself." The game required 90 man-years of development, which was spent simultaneously creating the game's content and the BioWare Infinity Engine. The primary script engine for the game (used mainly as a debugging tool) was Lua. DirectDraw was used for the graphics. Wasteland was a major influence on Baldur's Gate, particularly its design philosophy of having more than one possible method to achieve each goal. Unusually for the time, the graphics were not built from tiles; each background was individually rendered, which greatly extended the amount of time needed to create the game. At the time that the game was shipped, none of the sixty-member team had previously participated in the release of a video game. The time pressure to complete the game led to the use of simple areas and game design. Ray Muzyka said that the team held a "passion and a love of the art," and they developed a "collaborative design spirit." He believes that the game was successful because of the collaboration with Interplay. Baldur's Gate was released on November 30, 1998, and was published by Black Isle Studios, an internal division of Interplay. According to Feargus Urquhart, Interplay's commercial forecasts for Baldur's Gate were "very low". He noted that the publisher's headquarters in Britain predicted zero sales in that region. Lifetime projections for the German market were "no more than 50,000" copies, reported Udo Hoffman of PC Player. Internally, BioWare's worldwide sales goal was 200,000 units, a number that PC Zone's Dave Woods said would "justify work on the sequel." However, the game became an unexpected commercial hit. Ray Muzyka attributed this success in part to the Dungeons & Dragons license, and to the team's decision to use fan feedback during development, which he felt had increased the game's mass-market appeal. Following its shipment to retailers on December 21, Baldur's Gate began to sell at a "phenomenal rate", according to Mark Asher of CNET Gamecenter. He wrote at the time that its "first run of 50,000 copies sold out immediately and Interplay's elves are working hard to get more games to the stores." The title debuted in the United States at #3 on PC Data's computer game sales rankings for the week ending January 2, 1999. It sold-through 55,071 copies in the country by the end of 1998, for revenues of $2.56 million. In its second week, Baldur's Gate rose to #2 in the United States. Internationally, it debuted at #1 on Media Control's computer game charts for the German market in the first half of January 1999, and reached first place on Chart-Track's equivalent for the United Kingdom by its second week. According to Interplay, Baldur's Gate also took #1 on the charts in Canada and France. Its global sales reached 175,000 units by mid-January 1999, a sales rate that the Los Angeles Times reported as Interplay's fastest ever. This performance led to a stock-price increase for the company. In the United States, Baldur's Gate remained in PC Data's weekly top 3 from January 10 through February 6. It claimed #1 for January, with sales of 80,500 copies and revenues of $3.6 million in the country that month. Supply shortages continued throughout much of January. The game likewise secured Media Control's #1 position for the entirety of that month, and held at #1 for the United Kingdom in its third week. Baldur's Gate subsequently took #4 for February in the German market and #3 in the United States, after holding in the latter country's weekly top 10 from February 7–March 6. By mid-February, Gamecenter reported sales of 450,000 units for Baldur's Gate, which Asher called "the biggest hit Interplay has had since Descent" and a rebuttal to the common belief that role-playing games were commercially moribund. Worldwide sales totaled more than 500,000 copies by the end of that month. Despite these figures, Interplay posted a loss of $16 million for the fourth quarter of 1998, and of $28 million for the year. Brian Fargo attributed the losses in part to Baldur's Gate: he wrote that it "did not ship until the last days of 1998, which reduced shipments in the quarter to about half the projected volume." Baldur's Gate maintained its unbroken streak in PC Data's weekly top 10 through the week ending March 27, after which it was absent. It then took seventh for March, and was absent from the United States' monthly top 20 by April. However, it held in Chart-Track's British top 20 during April, after 13 weeks; and in Media Control's top 10 and top 20 during the second halves of March, April and May. Baldur's Gate's sales in the German market during its initial months reached 90,000 units, a success for the region. By the end of May 1999, it received a "Gold" award from the Verband der Unterhaltungssoftware Deutschland (VUD), for sales of at least 100,000 units across Germany, Austria and Switzerland. Coinciding with the release of the Tales of the Sword Coast expansion pack in the United States, Baldur's Gate returned to PC Data's top 10 for a week in May. Thereafter, it became a staple of the firm's monthly top 20 from May through August. Interplay reported worldwide sales of nearly 700,000 copies for Baldur's Gate by June, and it was the United States' second-best-selling computer game during the first half of 1999, behind SimCity 3000. As of September, it had sold above 300,000 units and earned roughly $15 million in revenues in the country during 1999 alone. A writer for PC Accelerator remarked that this success "created an almost audible sigh of relief from publisher Interplay." By November 1999, Baldur's Gate had sold roughly 1 million units worldwide. It claimed ninth place for 1999 in the United States, with a total of 356,448 sales that year. At $15.7 million in revenue, it was the country's seventh-highest-grossing computer game of 1999. Sales of Baldur's Gate continued in 2000: by March, it had surpassed 500,000 copies sold in the United States, which led Desslock of GameSpot to describe the title as an "undisputed commercial blockbuster". U.S. sales had risen to 600,000 units by April 2001, while global sales totaled 1.5 million copies that May. The game proceeded to sell 83,208 units in the United States from February 2001 through the first week of November alone. Worldwide, Baldur's Gate ultimately surpassed 2.2 million sales by early 2003. Baldur's Gate received positive reviews from virtually every major computer gaming publication that reviewed it. At the time of the game's release, PC Gamer US said that Baldur's Gate "reigns supreme over every RPG currently available, and sets new standards for those to come." Computer Shopper called it "clearly the best Advanced Dungeons & Dragons (AD&D) game ever to grace a PC screen". Maximum PC magazine compared the gameplay to Diablo, but noted its more extensive selection of features and options. The pixel-based characters were panned, but the reviewer stated that "the gloriously rendered backgrounds make up for that shortcoming." The main criticism was of the problems with the path finding algorithm for non-player characters. Despite this, the game was deemed an "instant classic" because of the amount of customization allowed, the "fluid story lines", and the replayability. The reviewer from Pyramid felt that the "basic buzz was positive" surrounding the development of the game. The "actual results are a mixed bag, but there's real promise for the future" thanks to the inclusion of the Infinity Engine. Baldur's Gate was named the best computer role-playing game of 1998 by the Academy of Interactive Arts & Sciences, the Academy of Adventure Gaming Arts & Design, Computer Gaming World, the Game Developers Conference, Computer Games Strategy Plus, IGN, CNET Gamecenter, The Electric Playground, RPG Vault, PC Gamer US and GameSpot. IGN, Computer Games and RPG Vault also presented it with their overall "Game of the Year" awards. The editors of Computer Games wrote that Baldur's Gate "delivers everything you could ask for in a computer game." According to IGN, Baldur's Gate did much to revive the role-playing video game genre. John Harris of Gamasutra wrote that it "rescued computer D&D from the wastebasket." According to GameSpy, "Baldur's Gate was a triumph [that] single-handedly revived the [computer role-playing game] and almost made gamers forgive Interplay for Descent to Undermountain". IGN ranked Baldur's Gate No. 5 on their list of "The Top 11 Dungeons & Dragons Games of All Time" in 2014. "Just how big was Interplay's role-playing game Baldur's Gate? Big enough to almost single-handedly revitalize the traditional RPG genre. Big enough to keep Interplay shareholders at least moderately appeased. And apparently big enough to spur new titles based on both its engine ... and its retail success." Baldur's Gate was the first game in the Baldur's Gate series. It was followed by the expansion pack Tales of the Sword Coast (1999), then the sequel Baldur's Gate II: Shadows of Amn (2000) and its expansion pack Throne of Bhaal (2001). As of 2006, total sales for all releases in the series was almost five million copies. The series set the standard for other games using AD&D rules, especially those developed by BioWare and Black Isle Studios: Planescape: Torment (1999), Icewind Dale (2000), and Icewind Dale II (2002). The novel Baldur's Gate (1999) by Philip Athans was based on the game. Baldur's Gate and its expansion were released digitally on Good Old Games (later GOG) on September 23, 2010. It has also been made available via GameStop App as part of the D&D Anthology: The Master Collection, which also includes the expansion Baldur's Gate: Tales of the Sword Coast, Baldur's Gate II: Shadows of Amn, Baldur's Gate II: Throne of Bhaal, Icewind Dale, Icewind Dale: Heart of Winter, Icewind Dale: Trials of the Luremaster, Icewind Dale II, Planescape: Torment, and The Temple of Elemental Evil. On March 15, 2012 a remake was announced entitled Baldur's Gate: Enhanced Edition, originally slated for release in Summer 2012. Five days later, Overhaul Games announced that the Enhanced Edition would also be released for the Apple iPad. On September 14, Trent Oster, president of Overhaul Games, announced that the game's release would be delayed until November, citing an overwhelming response and a desire to "make the best Baldur's Gate possible". The game was launched for Microsoft Windows on November 28, 2012, for iPad running iOS 6 or greater on December 7, 2012, for Mac OS X on February 22, 2013, and for Android on April 17, 2014. On March 17, 2012, Beamdog founder and former BioWare employee Trent Oster confirmed via Twitter that Baldur's Gate III would be the company's "long-term goal." ^ a b "Baldur's Gate Ships". RPG Vault. December 21, 1998. Archived from the original on July 27, 2011. Retrieved July 5, 2012. ^ "Baldur's Gate remake press release". Overhaul Games. March 15, 2012. Archived from the original on March 18, 2012. Retrieved March 15, 2012. ^ a b Harris, John. "Baldur's Gate (series)". Game Design Essentials: 20 RPGs. Gamasutra. Archived from the original on November 9, 2009. Retrieved October 5, 2009. ^ "Baldur's Gate Dual-Classing Guide". clankiller.com. Retrieved March 16, 2017. ^ "Planet Baldur's Gate: Experience Point Tables". IGN. Archived from the original on January 25, 2001. Retrieved December 29, 2013. ^ a b Carr, Diane; Burn, Andrew (2006). "Baldur's Gate". Computer games: text, narrative and play. Polity. pp. 31–33. ISBN 0-7456-3400-1. ^ Rollings, Andrew; Adams, Ernest (2003). Andrew Rollings and Ernest Adams on game design. New Riders Games Series. New Riders. p. 86. ISBN 1-59273-001-9. ^ "Mike's RPG Center - List of Baldur's Gate Joinable NPCs". mikesrpgcenter.com. Retrieved March 23, 2017. ^ "The Forgotten Realms Characters". giantbomb.com. Retrieved March 23, 2017. ^ a b Asher, Mark (January 20, 1999). "The Good Doctor of Baldur's Gate". CNET Gamecenter. Archived from the original on December 7, 2000. ^ a b c d e "NG Alphas: Forgotten Realms". Next Generation. No. 25. Imagine Media. January 1997. pp. 113–4. ^ a b c Muzyka, Ray (May 2, 2001). "Baldur's Gate II: The Anatomy of a Sequel". Gamasutra. Retrieved August 17, 2010. ^ Gutschmidt, Tom (2003). Game Programming with Python, Lua, and Ruby. Premier Press game development. Premier Press. p. 323. ISBN 1-59200-077-0. ^ Tofer, Cameron. "Re: lua and Baldur's gate". lua-users mailing list archive. ^ a b Carless, Simon (August 16, 2010). "GDC Europe: BioWare Doctors Look Back On Baldur's Gate Franchise". Gamasutra. Archived from the original on August 17, 2010. Retrieved August 17, 2010. ^ "Baldur's Gate II: Shadows of Amn Review". IGN. ^ a b Barton, Matt (August 30, 2014). "Matt Chat 255: Feargus Urquhart on Baldur's Gate, Shattered Steel, and Fallout". YouTube. Google. Retrieved January 21, 2019. ^ a b c d e Hoffman, Udo (May 1999). "NachSpiel; Baldur's Gate". PC Player (in German): 50. ^ Woods, Dave (January 2000). "It's Time for Double-Damage... Baldur's Gate II: Shadows of Amn". PC Zone (85): 16, 17. ^ Asher, Mark (December 31, 1998). "Game Spin: Retail Wrestling". CNET Gamecenter. Archived from the original on December 12, 2000. ^ Mullen, Micheal (January 12, 1999). "Brood War Tops PC Data List". GameSpot. Archived from the original on February 29, 2000. ^ Staff (April 1999). "The Numbers Game; Does Award Winner = Best Seller?". PC Gamer US. 6 (4): 50. ^ Fudge, James (January 19, 1999). "StarCraft: Brood Wars Tops Charts, Baldur's Gate Close Behind". Computer Games Strategy Plus. Archived from the original on April 6, 2005. Retrieved July 22, 2018. ^ a b "CD-ROM Spiele über DM 55,--; Stand 2. Hälfte Januar 1999" (in German). Verband der Unterhaltungssoftware Deutschland. Archived from the original on February 9, 1999. ^ a b "PC Gaming World's ELSPA Charts". GameSpot UK. January 27, 1999. Archived from the original on January 28, 1999. ^ "Baldur's Gate Hits #1, Sets Interplay Sales Records" (Press release). Irvine, California: Interplay Entertainment. January 14, 1999. Archived from the original on September 9, 1999. ^ Huffstutter, P. J. (January 18, 1999). "'Gate' Crashes Sales Records". Los Angeles Times. Archived from the original on January 22, 2019. ^ Staff (January 27, 1999). "Brood Wars Rules the Week's Charts". GameSpot. Archived from the original on March 8, 2000. Retrieved July 22, 2018. ^ Staff (February 2, 1999). "Baldur's Gate in the Lead". GameSpot. Archived from the original on February 26, 2000. Retrieved July 22, 2018. ^ Staff (February 9, 1999). "SimCity 3000: Top Seller". GameSpot. Archived from the original on March 8, 2000. Retrieved July 22, 2018. ^ Staff (February 18, 1999). "SimCity 3000 On Top". GameSpot. Archived from the original on February 29, 2000. Retrieved July 22, 2018. ^ Mullen, Micheal (February 16, 1999). "January's Top Sellers". GameSpot. Archived from the original on June 7, 2000. Retrieved July 22, 2018. ^ Asher, Mark (January 7, 1999). "Game Spin: Talking SMAC". CNET Gamecenter. Archived from the original on December 17, 2000. ^ Staff (March 15, 1999). "Sim City 3000 Takes February". GameSpot. Archived from the original on November 8, 1999. Retrieved July 22, 2018. ^ Fudge, James (February 23, 1999). "Sim City 3000 Hangs Tough at Top Spot". Computer Games Strategy Plus. Archived from the original on April 7, 2005. Retrieved July 22, 2018. ^ Staff (March 10, 1999). "SimCity Packs 'Em In". GameSpot. Archived from the original on November 19, 2000. Retrieved July 22, 2018. ^ Staff (March 16, 1999). "SimCity 3000 Still Top Seller". GameSpot. Archived from the original on March 3, 2000. Retrieved July 22, 2018. ^ Asher, Mark (February 17, 1999). "Game Spin: The Daikatana Demo". CNET Gamecenter. Archived from the original on October 13, 2000. ^ Jebens, Harley (February 24, 1999). "Interplay Financials". GameSpot News. Archived from the original on February 24, 2001. ^ Staff (March 25, 1999). "SimCity Still Number 1". GameSpot. Archived from the original on June 3, 2000. Retrieved July 22, 2018. ^ Staff (April 5, 1999). "SimCity Beats Back EverQuest". GameSpot. Archived from the original on June 19, 2000. Retrieved July 22, 2018. ^ Staff (April 13, 1999). "SimCity Steps Down". GameSpot. Archived from the original on March 6, 2000. ^ Fudge, James (April 16, 1999). "EA Tops Charts". Computer Games Strategy Plus. Archived from the original on April 7, 2005. Retrieved July 22, 2018. ^ Fudge, James (May 17, 1999). "Civilization: Call To Power tops April chart". Computer Games Strategy Plus. Archived from the original on May 2, 2005. Retrieved July 22, 2018. ^ "PC Gaming World's ELSPA Charts". GameSpot UK. April 13, 1999. Archived from the original on April 17, 1999. ^ Staff (June 1999). "Spiele-Charts". PC Player (in German): 64. ^ Staff (July 1999). "Spiele-Charts". PC Player (in German): 74. ^ Staff (August 1999). "Spiele-Charts". PC Player (in German): 60. ^ Staff (July 2, 1999). "VUD nennt vier neue Sales Awards". GamesMarkt (in German). Archived from the original on December 4, 2018. ^ Horn, Andre (January 14, 2004). "VUD-Gold-Awards 2003". GamePro Germany (in German). Archived from the original on July 18, 2018. ^ McKeen, Scott (May 25, 1999). "Computer wizards turn giant slayers". Edmonton Journal. Archived from the original on October 10, 1999. ^ Staff (May 19, 1999). "Baldur's Add-On Takes First". GameSpot. Archived from the original on March 4, 2000. ^ Fudge, James (June 15, 1999). "Star Wars Episode I: The Phantom Menace Tops Monthly Chart". Computer Games Strategy Plus. Archived from the original on May 2, 2005. Retrieved November 1, 2018. ^ Fudge, James (July 20, 1999). "Star Wars Episode I: The Phantom Menace Tops Monthly Chart". Computer Games Strategy Plus. Archived from the original on April 7, 2005. Retrieved November 1, 2018. ^ Fudge, James (September 1, 1999). "Half-Life Tops July Sales Charts". Computer Games Strategy Plus. Archived from the original on February 8, 2005. ^ Fudge, James (September 23, 1999). "Command & Conquer: Tiberian Sun Tops August Sales Charts". Computer Games Strategy Plus. Archived from the original on May 2, 2005. ^ "Black Isle Studios Ships DVD Version for Worldwide Hit, Baldur's Gate" (Press release). Irvine, California: Interplay Entertainment. June 10, 1999. Archived from the original on August 17, 2000. ^ IGN Staff (August 3, 1999). "And the Winners Are..." IGN. Archived from the original on March 5, 2000. Retrieved November 1, 2018. ^ Staff (February 2000). "X-Tra; Death of the PC". PC Accelerator (18): 100, 101. ^ Brenesal, Barry (November 2, 1999). "Heirs to Baldur's Gate: 5 new games to watch for". CNN. Archived from the original on January 5, 2002. ^ Desslock (April 11, 2001). "Desslock's Ramblings -- Heart of Winter Review and Editorial Follow-ups; Readers of the Week". GameSpot. Archived from the original on February 1, 2002. ^ Muzyka, Ray (May 2, 2001). "Baldur's Gate II: The Anatomy of a Sequel". Gamasutra. Archived from the original on May 10, 2012. ^ "About BioWare". BioWare. Archived from the original on February 7, 2003. Retrieved July 25, 2009. ^ "Baldur's Gate for PC". GameRankings. CBS Interactive. Retrieved June 27, 2010. ^ "Baldur's Gate for PC Reviews". Metacritic. CBS Interactive. Retrieved July 25, 2009. ^ Scorpia (April 1, 1999). "Baldur's Gate". Computer Gaming World. Archived from the original on August 16, 2000. ^ "Baldur's Gate Review". GameSpot. CBS Interactive Inc. Retrieved September 28, 2012. ^ Ward, Trent C. (January 19, 2012). "Baldur's Gate - BioWare proves that they are more than capable of carrying the AD&D torch". IGN. ^ a b "Baldur's Gate". 4 (6). June 1999: 90. ISSN 1522-4279. Retrieved June 27, 2010. ^ a b Wolf, Michael (April 1999). "Baldur's Gate". PC Gamer US. Archived from the original on March 6, 2000. Retrieved April 19, 2010. ^ Yans, Cindy (January 26, 1999). "Baldur's Gate". Computer Games Strategy Plus. Archived from the original on February 4, 2005. Retrieved November 1, 2018. ^ "Baldur's Gate [review]". The Electric Playground. Archived from the original on February 28, 2008. ^ Staff (April 1999). "Rating; Forgotten Realms: Baldur's Gate". Next Generation (52): 84, 85. ^ "Origins Award Winners (1998)". Academy of Adventure Gaming, Arts & Designs. Archived from the original on October 31, 2007. ^ "Archive / 1999 Spotlight Awards". Game Developers Conference. Archived from the original on July 3, 2011. ^ a b c Staff (February 11, 1999). "The Best of 1998". Computer Games Strategy Plus. Archived from the original on February 3, 2005. ^ a b IGN Staff (January 29, 1999). "IGNPC's Best of 1998 Awards". IGN. Archived from the original on April 4, 2002. Retrieved November 1, 2018. ^ Staff (February 16, 1999). "The Blister Award: The Best of 1998". The Electric Playground. Archived from the original on August 16, 2000. ^ a b Staff (January 16, 1999). "Best of 1998 Awards". RPG Vault. Archived from the original on March 23, 2003. Retrieved November 1, 2018. ^ Staff (March 1999). "The Fifth Annual PC Gamer Awards". PC Gamer US. 6 (3): 64, 67, 70–73, 76–78, 83, 84, 86, 87. ^ "Baldur's Gate (PC)". IGN. ^ Rausch, Allen (August 18, 2004). "A History of D&D Video Games - Part IV". Game Spy. Retrieved November 17, 2012. ^ Johnson, Leif (February 5, 2014). "The Top 11 Dungeons & Dragons Games of All-Time". IGN. Retrieved December 10, 2017. ^ Goble, Gordon (October 13, 1999). "Black Isle on Ice". CNET Gamecenter. Archived from the original on February 11, 2001. ^ Plunkett, Jack W. (2009). Plunkett's Entertainment and Media Industry Almanac 2009. Entertainment and Media Industry Market Research, Statistics, Trends and Leading Companies. Plunkett Research, Ltd. p. 210. ISBN 1-59392-471-2. Retrieved June 26, 2010. ^ "Baldur's Gate: The Original Saga". Good Old Games. ^ Deleon, Nicholas (September 22, 2010). "Good Old Games Not Shutting Down, Re-launches Tomorrow With Baldur's Gate Among New Games". TechCrunch. Retrieved March 16, 2012. ^ "D&D Anthology: The Master Collection". GameStop. ^ "Announcing Baldur's Gate: Enhanced Edition". Archived from the original on March 18, 2012. Retrieved March 15, 2012. ^ "Baldur's Gate: Enhanced Edition for iPad". March 20, 2012. Archived from the original on March 24, 2012. Retrieved March 22, 2012. ^ Oster, Trent (September 14, 2012). "Ship Date Delay". Retrieved September 26, 2012. ^ "Baldur's Gate 3 Announcement - Trent Oster Twitter". Retrieved March 17, 2012. ^ "Baldur's Gate 3 Announcement - PC Gamer". Retrieved March 17, 2012.